– The Loudun possessions was a notorious witchcraft trial in Loudun, France in 1634. A convent of Ursuline nuns said they had been visited and possessed by demons. Following an investigation by the Catholic Church, a local priest named Father Urbain Grandier was accused of summoning the evil spirits. He was eventually convicted of the crimes of sorcery and burned at the stake. 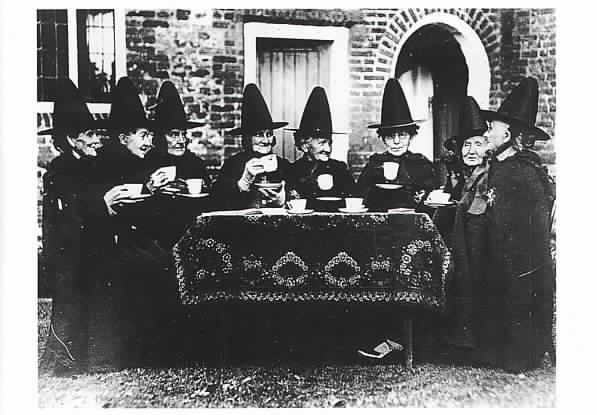 – The case is just one of many similar witchcraft trials that occurred in the 17th century throughout western Europe; for example the Aix-en-Provence possessions (France) in 1611 or the Pendle witches (England) in 1612 before reaching the New World by the 1690s. 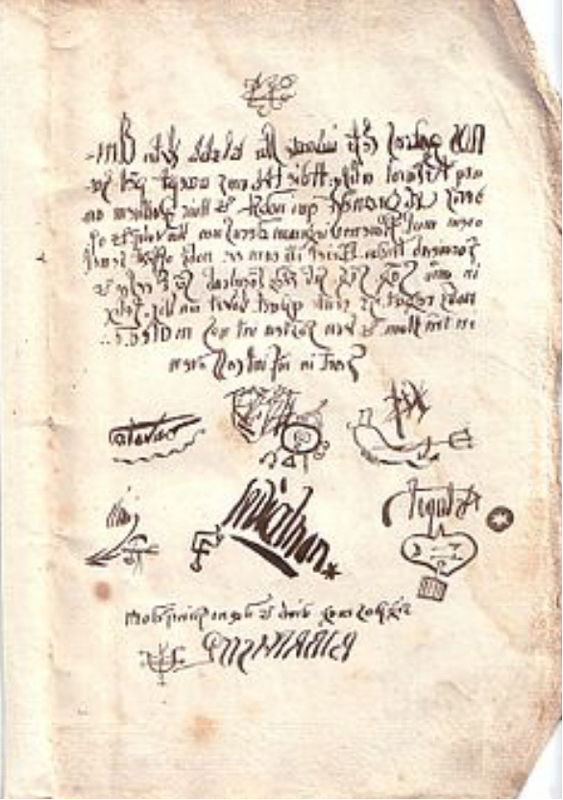 – The pact allegedly signed between Urbain Grandier and the Devil, stolen from the Devil’s cabinet of pacts by the demon Asmodeus. This page shows the signatures of all demons in possession of the Ursuline nuns at Loudun and the note added by Asmodeus. – Urbain Grandier was appointed parish priest of St-Pierre-du-Marche in Loudun, a town in Poitou, France, in 1617. Grandier was considered to be a very good-looking man, and was both wealthy and well-educated. The combination made the priest a target for the attention of girls in Loudun, one of whom was Philippa Trincant, the daughter of the King’s solicitor in Loudun. It was believed by the people of Loudun that Grandier was the father of Trincant’s child. In addition to Trincant, Grandier openly courted Madeleine de Brou, daughter of the King’s councillor in Loudun. Most assumed that Madeleine was Grandier’s mistress after he wrote a treatise against the celibacy of priests for her. – Grandier was also a very well-connected man, high in political circles. When he was arrested and found guilty of immorality on June 2, 1630, it was these connections that restored him to full clerical duties within the same year. Presiding over the case was Chasteigner de La Roche Posay, the Bishop of Poitiers, a man who was known to dislike Grandier and admitted to wanting him out of the parish. – Two stories exist about what happened next. Either the Bishop of Poitiers approached Father Mignon, confessor to the Ursuline nuns, and a plan was made to persuade a few of the sisters to feign possession and denounce Grandier, or Father Mignon was approached by the Mother Superior Jeanne des Anges (Joan of the Angels) for help. – According to the first story, Father Mignon readily persuaded the Mother Superior, Jeanne des Anges, and another nun to comply. They would claim that Father Grandier had bewitched them, falling into fits and convulsions, often holding their breath and speaking in tongues. – The second story claims that Jeanne had illicit dreams about Father Grandier, who appeared to her as a radiant angel. As an angel, he enticed her to sexual acts, causing her to rave loudly at night. Jeanne suffered flagellation and did penance for the night-time disturbances, but she was no less troubled and soon it was found that other nuns were being haunted by hallucinations and vulgar dreams. It was then, this version claims, that Mother Superior Jeanne des Anges called for Father Mignon to hear her confession and purge the convent of demons. – However it came about, Father Mignon and his aide, Father Pierre Barre, saw in the activity an opportunity to remove Grandier. Fathers Mignon and Barre immediately proceeded to perform exorcisms on the possessed nuns. Several of the nuns, including Jeanne des Anges, suffered violent convulsions during the procedure, shrieking and making sexual motions toward the priests. Following the lead of Jeanne des Anges, many of the nuns reported illicit dreams. 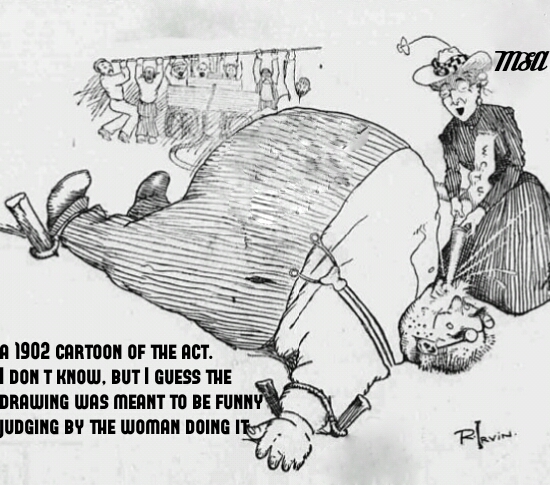 The accusers would suddenly bark, scream, blaspheme, and contort their bodies. During the exorcisms, Jeanne swore that she and the other nuns were possessed by two demons named Asmodeus and Zabulon. These demons were sent to the nuns when Father Grandier tossed a bouquet of roses over the convent walls. – Nearby and realizing the danger he was in, Father Grandier pleaded with the bailiff of Loudun to isolate the nuns; the bailiff’s orders were ignored, and the exorcisms and denouncements continued. Desperate, Grandier wrote to the Archbishop of Bordeaux, who sent his personal doctor to examine the nuns. No evidences of true possession were found, and the Archbishop ordered the exorcisms to cease on March 21, 1633. The nuns were sequestered in their cells. -Having failed to remove Grandier, his contemporaries continued their efforts in earnest. One of these was Jean de Laubardemont, a relative of Jeanne des Anges’ and favored by the powerful Cardinal Richelieu. Laubardemont and a Capuchin monk, Tranquille, visited the Cardinal with news of the unsuccessful exorcisms and added further evidence against Grandier by providing a copy of a libelous satire Grandier had written about Richelieu. – Aware that a relative of his, Sister Claire, was in the Loudun convent, Richelieu asserted his power and organized the Royal Commission to arrest and investigate Grandier as a witch. Laubardemont was appointed head of the commission. -Public exorcisms at Loudun – When exorcisms resumed at Loudun, they were led by the expert exorcists Capuchin Father Tranquille, Franciscan Father Lactance, and Jesuit Father Jean-Joseph Surin, and they were held publicly; up to 7,000 spectators attended. The priests employed dramatic commands, threats, and rituals to both direct and encourage the nuns in their accusations against Grandier. – Adding to the hysteria prompted by the public exorcisms were the stories told by both nuns and Father Grandier’s former lovers. As in both the Louviers possessions and the Aix-en-Provence possessions, the claims made against Grandier were overtly sexual and showed visible physical responses. Because they were public and dramatic, the citizens of Loudun and surrounding areas were set against Grandier. – In addition to the dreams that Jeanne des Anges and other nuns had related, Jeanne added a third demon to the array of possessors afflicting the nuns: Isacarron, the devil of debauchery. After admitting to this third demon possessor, Jeanne went through a psychosomatic pregnancy. In all, Jeanne and the other nuns claimed to be possessed by a multitude of demons: Asmodeus, Zabulon, Isacaaron, Astaroth, Gresil, Amand, Leviatom, Behemot, Beherie, Easas, Celsus, Acaos, Cedon, Naphthalim, Cham, Ureil and Achas. – In an effort to clear his name, Father Grandier performed an exorcism on the nuns himself. He spoke to the nuns in Greek, testing their knowledge of languages previously unknown to them (a sure sign of possession). The nuns had been coached, and responded that they had been ordered in their pact to never use Greek. -Torture at Loudun- On December 7, 1633, Father Grandier was put in prison at the Castle of Angers. His body was shaved and a successful search for devil’s marks was made by inquisitors. Protests by Dr. Fourneau, the physician who prepared Grandier for torture, and the apothecary from Poitiers were ignored. These protests claimed the inspection was a hoax, and stated that no such marks had been found. -Nicholas Aubin’s 1693 Romish Priest and Exorcists Discovered in the History of the Devils of Loudun describes what happened next: They sent for Mannouri the surgeon, one of [Grandier’s] enemies, and the most unmerciful of them all; when he [came] into the chamber, they stripped Grandier stark naked, blinded his eyes, shaved him every where, and Mannouri began to search him. 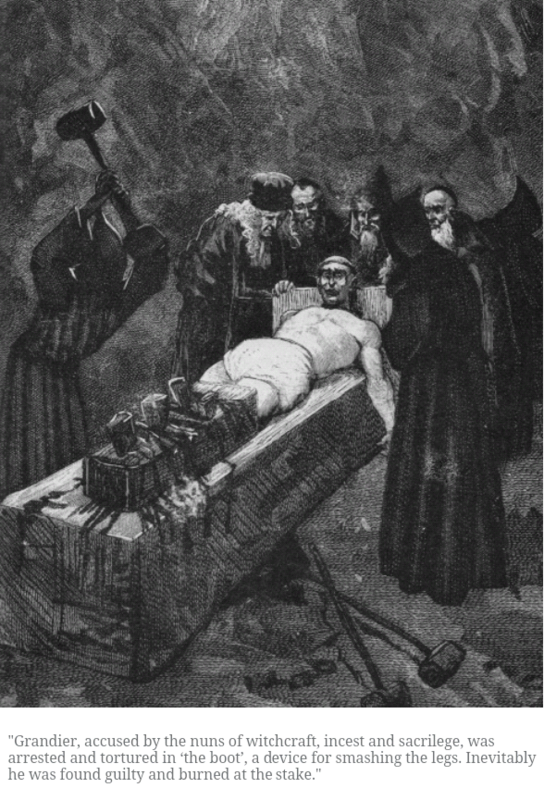 When he would persuade them that the parts of his body which had been marked by the Devil were insensible, he turned that end of the probe which was round, and he guided it in such a manner, that not being able to enter into the flesh, nor to make much impression, it was pushed back into the palm of his hand; the patient did not then cry out, because he felt no pain; but when the barbarous surgeon would make them see that the other parts of his body were very sensible, he turned the probe at the other end, which was very sharp pointed, and thrust it to the very bone; and then the abundance of people [outside] heard complaints so bitter, and cries so piercing, that they [were] moved…to the heart. – Other people spoke in Grandier’s defense, even some of the possessed nuns proclaimed his innocence. Laubardemont, fulfilling his duty to convict Grandier, explained that the nuns’ reactions were a ploy by Satan to save Grandier. Jeanne des Anges appeared in court with a noose tied around her neck, violently stating that she would hang herself if she could not recant her earlier lies. All defenses were ignored, and some defense witnesses were pressured to keep silent. Publicly, Laubardemont announced that any citizens who testified in favour of Grandier would be arrested as traitors to the King and have their possessions confiscated. Many of these witnesses fled France. – While the defense witnesses were forced to flee, 72 witnesses swore evidence against Grandier, who was denied the normal procedure of trial by a secular court. Had he been tried by secular court, Grandier could have appealed to the Parliament of Paris. Instead, Richelieu’s committee took charge of the legal proceedings. Grandier’s trial took place in Loudun itself, and he was closely imprisoned in the converted attic of a house there for the duration of it. – Nearly a year later, August 18, 1634, the Royal Commission found Grandier guilty of all counts against him and passed sentence – Grandier would be burned alive at the stake. 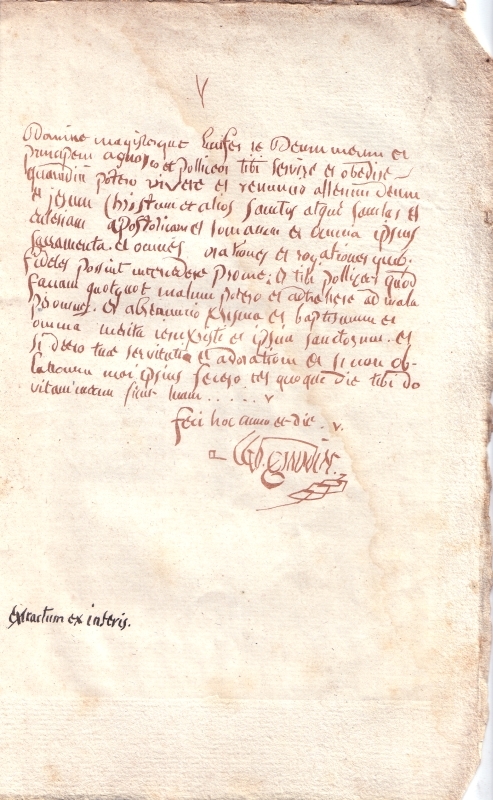 – We have ordered and do order the said Urbain Grandier duly tried and convicted of the crime of magic, maleficia, and of causing demoniacal possession of several Ursuline nuns of this town of Loudun, as well as of other secular women, together with other charges and crimes resulting there from. For atonement of which, we have condemned and do condemn the said Grandier to make amende honorable, his head bare, a rope round his neck, holding in his hand a burning taper weighing two pounds, before the principal door of the church of St. Pierre-du-Marché, and before that of St. Ursula of this town. There on his knees, to ask pardon of God, the King, and the law; this done, he is to be taken to the public square of St. Croix, and fastened to a stake on a scaffold, which shall be erected on the said place for this purpose, and there to be burned alive…and his ashes scattered to the wind. We have ordered and so do order that each and every article of his moveable property be acquired and confiscated by the King; the sum of 500 livres first being taken for buying a bronze plaque on which will be engraved the abstract of this present trial, to be set up in a prominent spot in the said church of the Ursulines, to remain there for all eternity. And before proceeding to the execution of the present sentence, we order the said Grandier to be submitted to the first and last degrees of torture, concerning his accomplices. “The Boot” consisted of a total of sixteen to eighteen wedges driven between planks strongly bound to his legs, designed to slowly break the bones. He refused to name any accomplices, which drove Father Tranquille to break both Grandier’s legs. 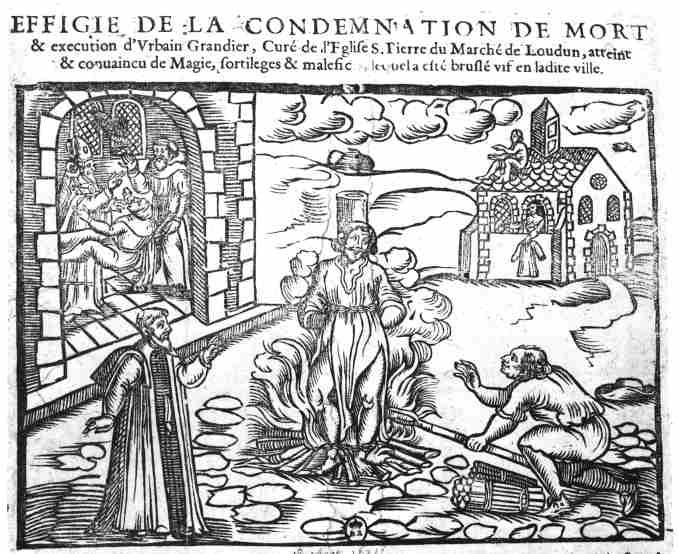 – Burning at Loudun – Father Grandier was promised that he could have the chance to speak before he was executed, making a last statement, and that he would be hanged before the burning, an act of mercy. From the scaffold Grandier attempted to address the crowd, but the monks threw large quantities of holy water in his face so that his last words could not be heard. Then, according to historian Robert Rapley, exorcist Lactance caused the execution to deviate from the planned course of action–enraged by taunting from the crowd that gathered for the execution, Lactance lit the funeral pyre before Grandier could be hanged, leaving him to be burned alive. -The possessions failed to stop after Father Grandier’s execution; as a result, public exorcisms continued. In his summary of the Loudun possessions, author Moshe Sluhovsky reports that these displays continued until 1637, three years after Grandier’s death: “[t]he last departing demons left clear signs of their exit from her [Jeanne des Anges, the mother superior of the community] body, when the names Joseph and Mary miraculously appeared inscribed on des Anges’s left arm.”5 Allegedly, the Duchess d’Aiguillon, niece to Cardinal Richelieu, reported the fraud to her uncle. Having achieved his original goal, Richelieu terminated the investigations into the events at Loudun. -Some claim that it was actually Jeanne des Anges who had the public exorcisms stopped. Jeanne allegedly had a vision that she would be freed from the Devil if she made a pilgrimage to the tomb of Saint Francis of Assisi. She went to Annecy, then visited Cardinal Richelieu and King Louis XIII in 1638; the demons were apparently gone. Jeanne des Anges remained convinced of her own saintliness until she died in 1665. – Demonology, the demon Gressil is written of for the first time in the records of the Loudon possessions. Sebastien Michaelis would later assign Gressil the status of demon of impurity and uncleanliness, third in the order of Thrones. – Grandier became an enemy of Cardinal Richelieu after an anonymously published libelous satire appeared in 1618 and was attributed to Grandier. Further actions by Grandier may have played a major role in gathering the cardinal’s anger. While in Loudun, Jean de Laubardemont was to oversee the demolition of the town’s fortifications, including the Castle of Loudun. Part of Richelieu’s program to eliminate Huguenot strongholds by destroying local fortifications, and the success of his mission would have helped cement the cardinal’s power both within the church and within France. – Protestant (Huguenot) and Catholic residents of Loudun were both against the removal of their battlements, which would leave them unprotected against mercenary armies. Grandier cited the King’s promise that Loudun’s walls would not be destroyed and prevented Laubardemont from demolishing the fortifications. Laubardemont promptly reported back to Richelieu with the tale of failed exorcisms, the libelous satire, and Grandier’s recent hindering of Richelieu’s plans. – Finally, another aim was achieved by the Loudun Possessions: conversion to Catholicism. 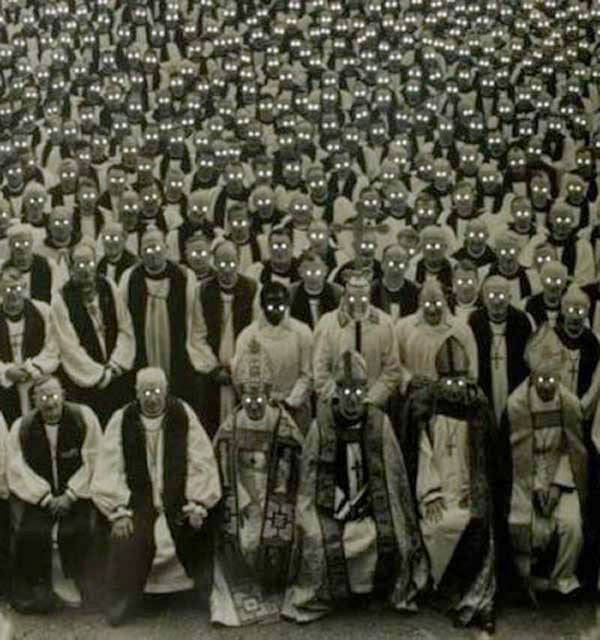 Many of the Protestant townspeople converted to Catholicism as a result of the public exorcisms, further eroding any Huguenot sentiment in the region. – Historians today believe that the causes of the injustice committed at Loudun were a mixture of political ambition, the need for attention, and a basic desire to dispose of political opponents. 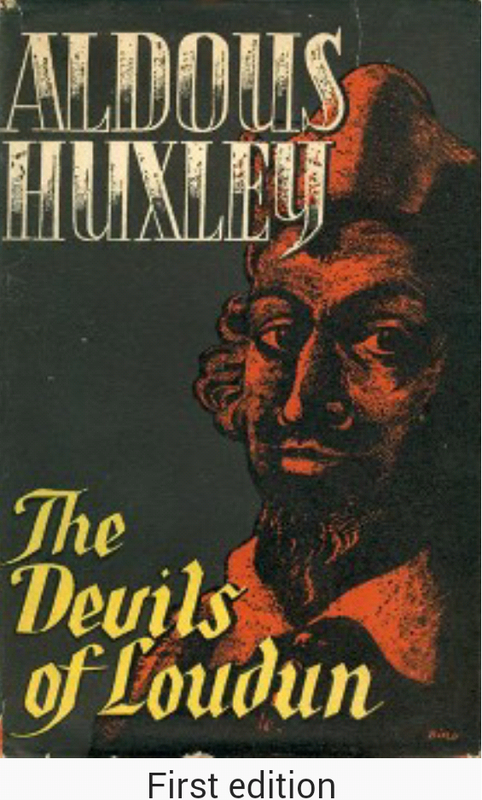 – The book referred to throughout this blog, ‘The Devils of Loudun’, is a 1952 non-fiction novel by Aldous Huxley. It is a historical narrative of supposed demonic possession, religious fanaticism, sexual repression, and mass hysteria which occurred in 17th century France surrounding unexplained events that took place in the small town of Loudun; particularly on Roman Catholic priest Urbain Grandier and an entire convent of Ursuline nuns, who allegedly became possessed by demons after Grandier made a pact with Satan. The events led to several public exorcisms as well as executions by burning. – The story was adapted into a stage play in 1960, which was then adapted into the controversial 1971 Ken Russell film The Devils, which starred Vanessa Redgrave and Oliver Reed. There is also an opera based on the book, Die Teufel von Loudun, by Krzysztof Penderecki. The book, though lesser known than Huxley’s other novels (such as Brave New World) is widely considered one of his best works. 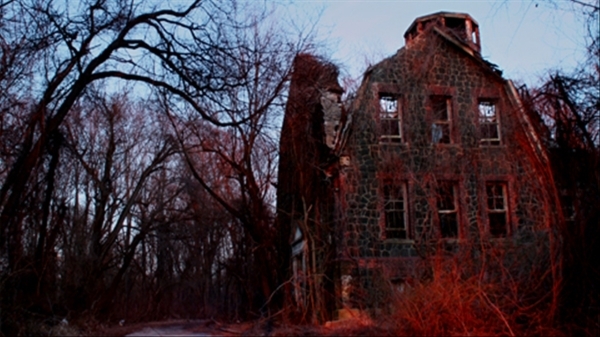 – The Cropsey urban legend developed throughout the 70s and 80s after several children went missing from Staten Island. – The story, told powerfully in the recent documentary entitled Cropsey, initially revolved around a classic but creepy boogeyman-type figure who stole children. – Cropsey director Joshua Zeman remembers when he was young and growing up in Staten Island. – Meanwhile, nestled in the woods nearby was the Willowbrook State facility for mentally challenged children–an institution now notorious for squalid living conditions. In the late 80s, police finally began to hone in on a man named Andre Rand, a former Willowbrook employee, who had since lived out in the woods. 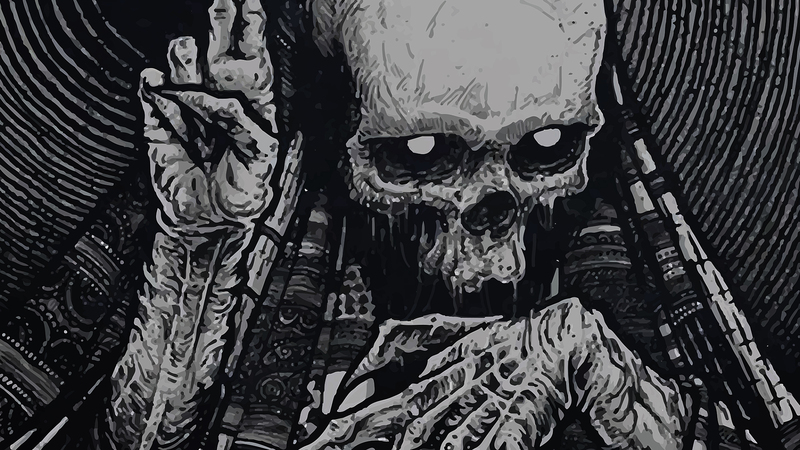 He was a drug user and possibly an occultist with a lengthy rap cheat–the perfect candidate for our real-life boogeyman. – Though he was never officially charged with the Staten Island child murders, Rand is currently serving 50 years to life for kidnapping and first-degree murder and is still the top suspect in the Cropsey disappearances. 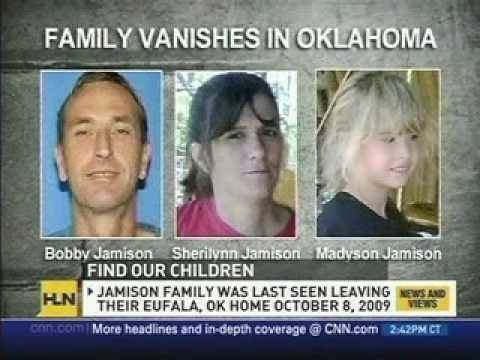 ~THE JAMISON FAMILY~ – On October 8, 2009, the Jamison family—44-year-old Bobby Dale Jamison, 40-year-old Sheri Jamison, and 6-year-old Madyson Jamison—went missing. They were last seen alive when they were out looking at a property they planned to buy, just outside of Eufaula, Oklahoma. Nine days later, their pickup truck was found abandoned. -The vehicle contained all the Jamisons’ personal belongings, including their dog, which was incredibly malnourished. Their cell phones were inside, along with their wallets, IDs, and a bag with $32,000 cash. Their remains weren’t found until four years later, when two hunters found them in an isolated area. The bodies had decomposed too much to determine a cause of death. Several theories tried to explain what had happened to the family of three. -The first concerned the large amount of cash they’d had on them. It was suspected that they might have been involved with drugs. However, no other evidence pointed to that. -The second theory involved Bobby’s father, Bob Jamison. Bobby had sued his parents over property that he’d claimed he was owed after working at the family business. The Jamisons then had to get a protective order against Bob Jamison because he’d twice threatened to kill them. However, at the time of the disappearance, Bob was sick and was either in the hospital or at home resting. -That brings us to the third theory. Leading up to their disappearance, the Jamisons had been acting strange. They’d lost a bunch of weight. They spoke to their pastor, saying that their house was being haunted by ghosts. Two of the ghosts had names—Emily and Michael. Six-year-old Madyson allegedly talked to Emily’s sister, a ghost with wings. -Police never figured out who wrote the message and when Sherilyn’s mother was questioned, she blamed a cult for the murders. She wouldn’t say which cult, but it was one that worked in Southeast Oklahoma. She also denied that the family was involved with witchcraft. -To date, no one is sure what happened to the Jamisons or if they were the victims of the occult and foul play.